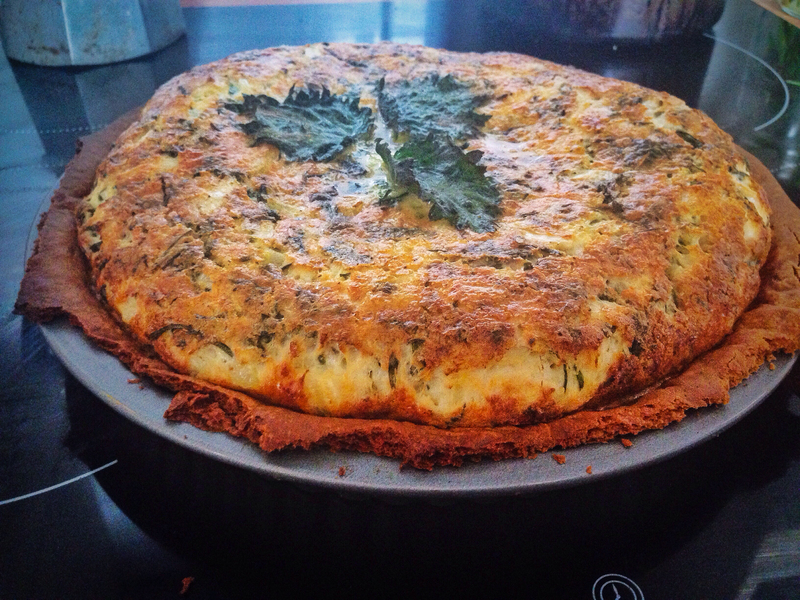 Another of the recipes from my wild food in the kitchen talk at Old Dalby WI, this is a really simple quiche that you can chuck all your green bounty into. Now once I’d admitted that I hadn’t made the pastry for this myself I thought I would have been politely escorted from the village hall by the WI ladies but they very generously did not revoke my speaker’s pass and allowed me to continue! A few handfuls of assorted gathered young green shoots. I used: nettle tops, chickweed, dandelion, wild garlic and goose grass, they will shrink right down. 1: Wash your greens and blanch in boiling water for a couple of minutes, drain, squeeze out any excess liquid and roughly chop. 2: Roll out your pastry and put into a tart tin with removable bottom, use a bit of pastry to push the sides and base down. Cover with some baking parchment and fill with baking beans and bake in an oven heated to 180C for about 15 minutes. 3: Remove the parchment and beans, gently prick the base with a fork and return to the oven for about 7-10 minutes. 4: Fry the onion in the butter occur a low heat until soft but not coloured, allow to cool. 5: Mix the flour together with one egg and a little of the milk to form a paste, add the remaining eggs, cream and milk and mix really well. 6:Add the cooled onions and butter and season generously, add nutmeg if using. Arrange a few nettle leaves on the top, use gloves! 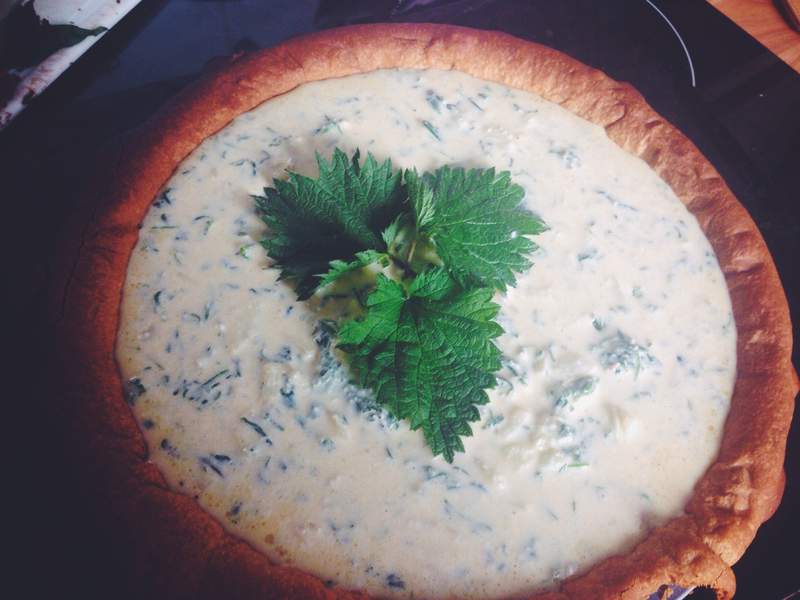 8: Reduce the oven temperature to 170C and bake the tart for around 35-40 minutes. 9: Once the tart is baked, trim off the pastry edges to tidy it up ( I haven’t yet done this in the pic above) and serve either warm straight away of allow to cool.